The leading surface protection mat that keeps floors and counters safe from damage and debris during construction. Absorbs paint, oil, grease, and cleaning agents. Anti-slip properties promote a safe working environment. This product has a tacky side to it, but it also states that it is reusable.....how many uses can you get before the tackiness wears out? I am looking for a rubber mat to use as a chair mat for a shop area, the standard chair mats generally clear in color slide on the concrete and other flat surface flooring. Do you have anything that would provide safe protection that would allow an office chair to run on it without much friction? I am getting new laminte wood floors put in my home and my couch has a metal frame. We are in the process of rennovating and will eventually move. Would this be good for short term and protect the floor being messed up if we use underneath the couch. any info would be greatly appreciated as we are not sure what we could use. Thank you! The leading surface protection mat that keeps floors and counters safe from damage and debris during construction. Soft like felt. Absorbs paint, oil, grease, and cleaning agents. 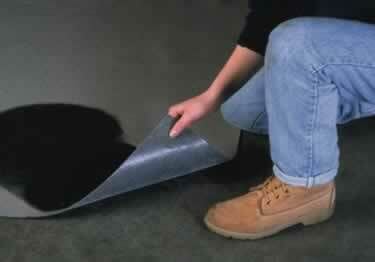 Anti-slip properties promote a safe working environment. I�m cleaning when I�m running hoses. & also traps debris. Easy to use. Effective. We bought this floor protection to cover our wood floors for a large home party. It was easy to roll out and cut around corners and built-ins, and the tacky side keeps it from slipping. The soft surface also helped to dampen the noise a little for our downstairs neighbors. It was just the thing we needed, the price was reasonable, and the purchase and shipping all went smoothly. Thank you!